It is extremely difficult to have a wedding where there are no last-minute rushes. Planning your wedding is no easy task. A lot of research is needed on the venue, date, wedding theme, costumes, wedding styles and other aspects. However, organizing your wedding planning is one way to avoid confusions and to have everything in place. This can be done by having a wedding planning checklist. Though some couples feel that a checklist is not needed as they have covered all the aspects, there is bound to be a few vital things missing at the last moment. In order to avoid that, and to have a well-organized wedding, a checklist is required. A checklist will guarantee that no items are missing. Everything that is needed is available at the right time to the right people. A wedding checklist will ensure that each of your tasks is done properly and on time. It will also let you know what tasks are completed and what are still to be done. This will enable you to plan your time and work accordingly. A checklist is needed even when throwing a small party. Your wedding party is probably the biggest party you will throw. Thus, having a checklist is mandatory. The reason you should have a checklist is simple, so that you know what you are doing! You need to decide on the theme for wedding, wedding style, dress, flowers, decoration, cake and so many other things. You cannot keep a mental track of everything. Your checklist will take care of every small thing that you need. It will ensure that nothing is forgotten accidentally. 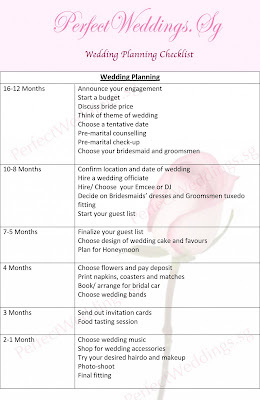 A wedding checklist is very crucial as it will ensure that you are organized. For example, on your checklist you have mentioned the time and date of your appointment with the dress designer. If not in the checklist, you might otherwise forget it and then it could be difficult to get a second appointment. Also, when you mention your entire budget for the wedding in the checklist, you can keep a tab of your expenses to ensure you don't cross the limits. In your checklist for guests, you can keep a tab of whom to invite, how many already contacted, etc. Thus, a checklist is the essence of your entire wedding planning. With the checklist, you will be able to track everything. You can have a master checklist containing the highlights of all the task and then individual checklist for each task. The various kinds of checklists you can have are a guest checklist, a wedding attire checklist, ceremony checklist, reception checklist, transportation checklist and miscellaneous checklist where all other small tasks must go. It is not difficult to make a checklist. Nowadays, wedding checklists are available on wedding sites on the internet. You can take a printout or work on the online organizer. Remember, it's your wedding and it must be as perfect as it can be. Therefore don't miss on anything. 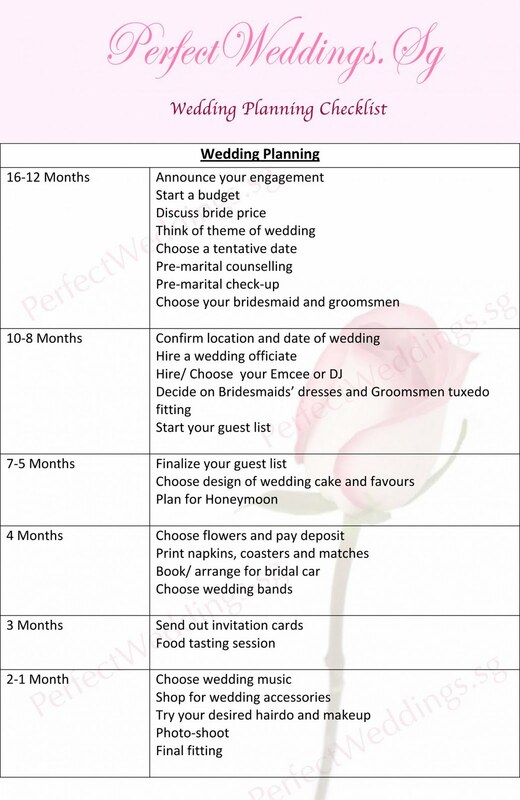 Plan every moment with the help of a checklist and it is sure to make your wedding memorable for you.